Our sister blog pixels is celebrating it's photo #1000. Allow us here on plenty to offer some tulips for the occasion. 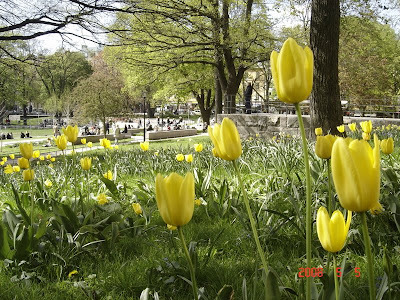 Lovely, what an adorable, pale yellow nuance of those tulips. It's enchanting, Pia, I agree. And this time the camera lies. The tulips didn't actually stand still. Nothing stood still. It was quite windy and this shot took several attempts to catch. Awww this is a lovely photo. Yellow tupils looks fab!